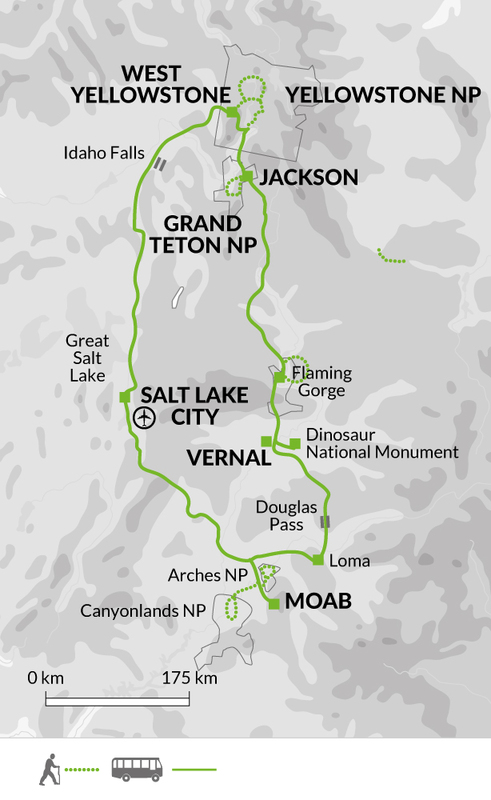 Following scenic park trails discover some of the most spectacular scenery in North America's national parks. The variety is endless, from glaciers and rivers, to deserts and canyons, hot springs and waterfalls. View the geysers of Yellowstone National Park, meander among the hoodoos and rock formations of Arches and Canyonlands and hike along the shores of dramatic glacial lakes. The trip begins in Salt Lake City, Utah's capital. Depending on your flight arriavl there may be time to take a stroll around the centre. Founded by a group of believers of the Church of the Latter Day Saints (Mormons) in 1847, the city is now their international headquarters and some of the finest buildings are ecclesiastical. The setting, below the Wasatch Mountains and beside the Great Salt Lake, is superb and makes this a pleasant city to explore on foot. Leaving early we journey north towards the Rockies, aiming to reach the outskirts of Yellowstone National Park. We travel through Utah and Idaho passing through National Forests and the Fort Hall First Nations reservation. The scenery today is on a par with Yellowstone itself, and we plan to stop off at the magnificent Mesa falls, on the approach we witness the toothy skyline of the Teton Range, which thrusts up 2135 metres from the plains - out to the north you can see Big Bend Ridge, the western flank of a volcano that erupted 1.3 million years ago. We reach West Yellowstone late in the day, our long drive enabling us to make the most of our time here. The elevation of this area is just under 2300 metres, so nights can be cold. We have almost three full days to thoroughly explore the wonderland of Yellowstone National Park by vehicle and on foot. Sitting on an average altitude of 2400m (which can make the nights cold) and surrounded by five different mountain ranges of the Middle Rocky Mountains, Yellowstone is a gigantic park covering almost 9000 square kilometres in Wyoming, Montana and Idaho. It is an ancient volcanic plateau home to more than 10,000 geysers, hot springs, fumaroles and mud pots which we pass. There are flowery alpine meadows to explore where wild animals roam. Although scenery is the primary draw of this area, the park abounds with wildlife. Having been protected from hunters since the park's inception, bear, moose and elk are frequently seen.Buffalo Bill was the first to bring tourists here (often royalty he'd met on his travels) and these visitors, like us, marvelled at the spectacular scenery. The volcanic activity frightened the First Nation people who believed this to be the land of evil spirits, and so the wilderness remained unexplored until it was declared the first National Park in 1872. We plan two half day walks in the park. The itinerary is flexible depending on local conditions and the ability of the group but will incorporate areas such as the Grand Canyon of Yellowstone with its beautiful waterfalls, Mud Volcano, Beaver Ponds Trail and Mammoth Hot Springs. Today's eight kilometre hike on the South Rim Trail is expected to take around three hours with 100 metres of ascent and descent. Today we continue exploring more of Yellowstone National Park. We drive to Mammoth Hot Springs and walk the Beaver Ponds Trail. Mammoth Hot Springs is a large complex of hot springs on a hill of travertine. The most well-known is the Minerva Terrace boasting a wide range of bright colours and ornate travertine formations. Today's nine kilometre hike is expected to take around three hours with 190 metres of ascent and descent. There are more geysers in Yellowstone than anywhere else on earth and before leaving the park this afternoon we drive to the Upper Geyser Basin to explore some of these including Old Faithful. As the name suggests, Old Faithful never disappoints its spectators - eruptions occur about 20 times a day, reaching a height of 30-55m. We will take several trails to admire and discover these wonders of nature, walking from Firehole River to Geyser Hill , perhaps diverting to Morning Glory and Biscuit Basin. In the afternoon we travel on to Grand Teton National Park via Colter Bay where we visit a First Nations Arts museum (optional). We continue to our base, just outside the park, for the next four days. The Grand Teton area is blessed with some of the most dramatic mountain scenery anywhere in North America - 10 summits carved by glaciation tower three kilometres above the valley floor. At the foot of the mountains lies a necklace of sparkling lakes. These jagged pinnacles are the inspiring back-drop for our hikes in the park. Today's seven kilometre hike is expected to take around two-and-a-half hours along a flat route. On our first day we drive to Jenny Lake. You may follow the shoreline on foot and follow this scenic walk up to Hidden Falls and Inspiration Point. From here there is the option to continue walking to South Jenny lake on the eastern path or further to Cascade Canyon passing beneath Mount Aven where moose and bear are often spotted. On the return it is possible to take the passenger ferry (optional) which plies across the blue waters of Jenny Lake, back to our transport waiting on the far side - high above hangs the Teton Glacier, a stunning finale to our walk. Today's eight kilometre hike is expected to take around three hours with 120 metres of ascent and descent. The extension walk to Cascade Canyon is approximately a further six hours return with 300 metres of ascent and descent, there is the option to shorten this by taking the boat from Inspiration Point. Our second day is free for relaxing in nearby Jackson, an ideal place to wind down after the last few days. The downtown area still has the boardwalks so typical of the first town in the west and has some good shopping. It is an excellent centre for outdoor activities: grade 3 rafting trips on the Snake River can be arranged or you could perhaps hire a bike for some independent sightseeing. The final day in Grand Teton can be spent hiking up to Amphitheatre Lake - a challenging trek which rewards the traveller with remarkable views of Jackson Hole and its lakes. For those wishing something easier, it is possible to stroll around one of the many nearby glacial lakes such asTaggart and Bradley. Today's 16 kilometre hike is expected to take around six hours with 890 metres of ascent and descent. This morning we drive through the Gros Ventre range onto the Sublette Plateau, heading down through the rich red-hued rock of Flaming Gorge, appropriately named by Major John Wesley Powell whilst on his famous expedition in 1869. Once a hideout for Butch Cassidy, Flaming Gorge is now home to wildlife such as Osprey which are often spotted nesting on craggy rock pinnacles and clifftops and here we explore the Canyon Rim Trail on foot. Tonight we stay near the town of Vernal. Today's four kilometre hike on the Canyon Rim Trail is expected to take around one-and-a-half hours along a flat route.s. Today we traverse the high desert landscape which switches to pine clad mountains as we enter the state of Utah. Here we explore the Dinosaur National Monument, renowned for the exceptional number of dinosaur bones discovered in one single sandstone cliff, including Brontosaurus. We journey across the 2511 m high Douglas Pass to Moab. Waking early to take advantage of the brief respite from the desert heat, we drive to the Fisher Towers, one of the most outstanding scenic features of Utah's Colorado Riverway. Rock pinnacles soar above a maze of red and purple hued canyons. The hiking trail along the base of the towers offer excellent views. In the late afternoon, we head to Canyonlands National Park where we explore the arid, canyon incised region set at an altitude of 1800 metres, known as the 'Islands in the Sky'. The plateau is set 600 metres high above the confluence of the Green River and the Colorado. Today's seven-and-a-half kilometer hike to Fisher Towers is expected to take around three-and-a-half hours with 550 metres of ascent and descent. This afternoon's four-and-a-half kilometre trail to Grand View Overlook is expected to take around one-and-a-half hours. As well as being ideally located for walks in the nearby parks, Moab is one of the USA's leading adventure centres where you can take advantage of the many activities on offer. The opportunities are boundless, for example taking an optional half day float trip on the Colorado River - a unique way to view the towering canyons and experience the silence and beauty of this remote area. We use inflatable kayaks and will travel over some small rapids, but no experience is necessary. There is also an opportunity to make an optional jeep excursion to visit areas which are inaccessible to other vehicles, perhaps seeing petroglyphs left behind by the Ancient Ones. Today we visit the extraordinary Arches National Park, where more than 1,600 natural arches have been sculpted over the years by wind, sun, frost and rain, creating a strange rockscape in the desert. Soft Entrada Sandstone - a 91m layer of rock deposited as sand during the Jurassic Period - has been eroded into twisted spires, fins and arches which are particularly beautiful in the morning and afternoon when they take on a fiery glow in the low light. The famous Delicate Arch has become Utah's symbol and seems to defy gravity as the large precariously-balanced boulders hover near the edge of a cliff. Today's five kilometer walk is expected to take around two-and-a-half hours with 170 metres of ascent and descent. We return to Salt Lake City, Utah's capital, with time to take a stroll around the centre. Founded by a group of believers of the Church of the Latter Day Saints (Mormons) in 1847, the city is now their international headquarters and some of the finest buildings are ecclesiastical. The setting, below the Wasatch mountains and beside the great salt lake, is superb and makes this a pleasant city to explore on foot. The trip ends in Salt Lake City this morning after breakfast. This trip covers a variety of altitudes and, being early and later season the temperatures will get cold experience freezing or below freezing temperatures and could encounter snow. Although temperatures in this area can be high during summer - sometimes over 40°. One main bag plus a small daypack for walking and for personal items. Main luggage cannot be accessed during the day. Soft luggage is more practical than a hard shell suitcase for loading into the trailer. Please pack light as you will be expected to carry your own luggage at times. Laundry facilities will be available at various points during the trip. A 20-30 litre day sack is recommended. You will need to carry what you need for the day which may include a raincoat, jumper, camera, sun-cream, water and picnic lunch. On hot days you will carry fewer clothes but more drinking water. Please note: Sleeping bags can be purchased from a store for as low as US $50. Please ask your Tour Leader on arrival. The simple Log Cabins are like camping at its best. Cabins have a double bed or twin size bunk beds. They have electricity and heat but no running water or bath facility. You will need a sleeping bag. Water is available nearby outside your cabin. Grills for cooking are also available in front of your Cabin. Restrooms and showers are located in 3 complexes throughout the property. ESTA - Citizens of the UK, New Zealand, Australia and passport holders from several EU countries can apply for an ESTA here - https://esta.cbp.dhs.gov - you must have an electronic passport with a digital chip containing biometric information. If you have visited Libya, Iran, Iraq, Somalia, Sudan, Syria or Yemen since March 2011, or dual national of these countries, you cannot travel with an ESTA. In this case you will need to apply for a visa from the nearest US embassy or consulate. Citizens of the UK, New Zealand, Australia and passport holders from several EU countries can apply for an ETA here - http://www.cic.gc.ca/english/visit/eta.asp - other nationalities should consult their local embassy or consular office. 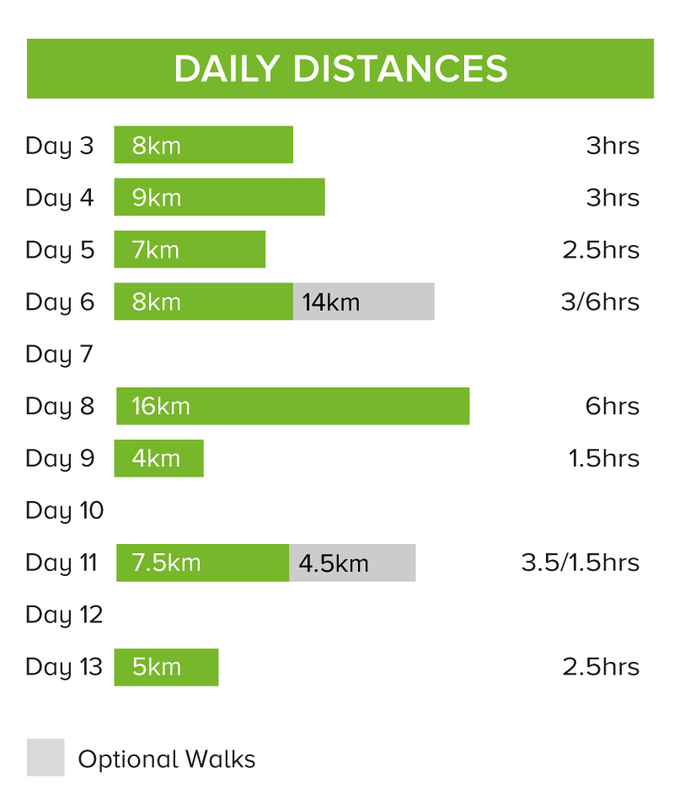 Walks on 8 days for between 1.5 to 6 hours each day. The trails are well maintained and easy to follow. On day 8 in Grand Teton there is the option of an alternative easier route to see the lakes. Information The Comfort Inn provides a courtesy shuttle bus to the airport. Information Please note that the Comfort Inn provides a free shuttle service to and from the airport.